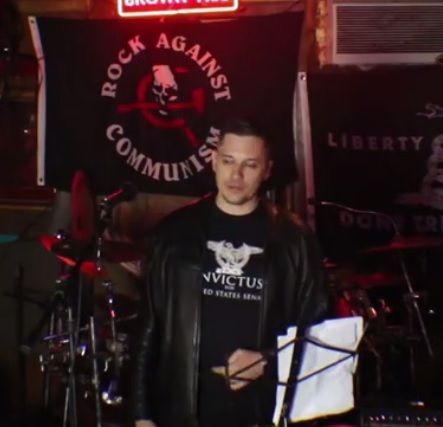 Fascist lawyer and candidate for US Senate Augustus Invictus has been dropped as a presenter at the International Left Hand Path Consortium occultist event in Atlanta, April 8-10. The story of Invictus being removed from the Consortium lineup appeared on Watcher of the Dawn, a website serving as a “watchdog for the occult scene.” Invictus’ removal has also been independently verified by other sources. The decision to remove Augustus Invictus as a presenter appears to be partially due to some Consortium presenters dropping out from the event because of Invictus’ fascist politics and political organizing with neo-Nazis. A more proximate cause of Invictus’ cancellation, however, seems to have been Augustus Invictus having an online meltdown, in which Invictus goaded his critics to “kill me”. This appears to have unsettled event organizers and caused them to pull the plug on Invictus. In recent weeks, main Consortium organizer Laurie Pneumatikos had staunchly defended Invictus’ appearance at the Consortium, removing any anti-racist criticism from the event Facebook page. With the cancellation of Invictus from the Consortium in Atlanta, Pneumatikos’ written defense of Invictus (in response to concerns raised on this site) has also vanished from the Consortium website. At least one additional Consortium presenter has now dropped out of the event in solidarity with Invictus, a development which suggests that parts of the occult milieu remain deeply divided over fascism and how to respond to it (or not to respond.) Now seems like a good time to give kudos to those who made the potentially-uncomfortable decision to speak out against fascism and racism in their community. Meanwhile, Augustus Invictus remains scheduled to speak at the flagrantly neo-Nazi gathering/rally of the National Socialist Movement on April 23 in Rome, Georgia. Update: The International Left Hand Path Consortium has now issued a statement. For whatever it’s worth, you can read it here.